Let's face it... it's not easy to receive constructive criticism! No matter your age, it can be difficult to hear that you did something incorrectly, or that something you were proud of isn't quite as perfect as you first thought it was! However, that's what we expect our students to do daily. 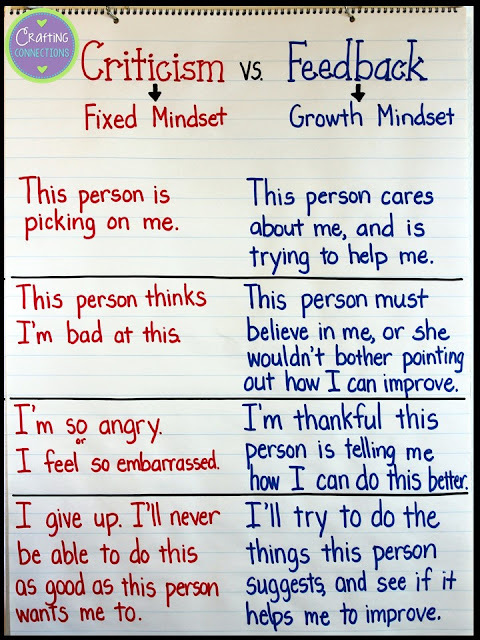 Helping students to learn how to respond to these comments with a growth mindset is a worthwhile undertaking, as it is an ability they will be able to use throughout their lives. Today, I am going to share a lesson that you could use to introduce this concept to students. 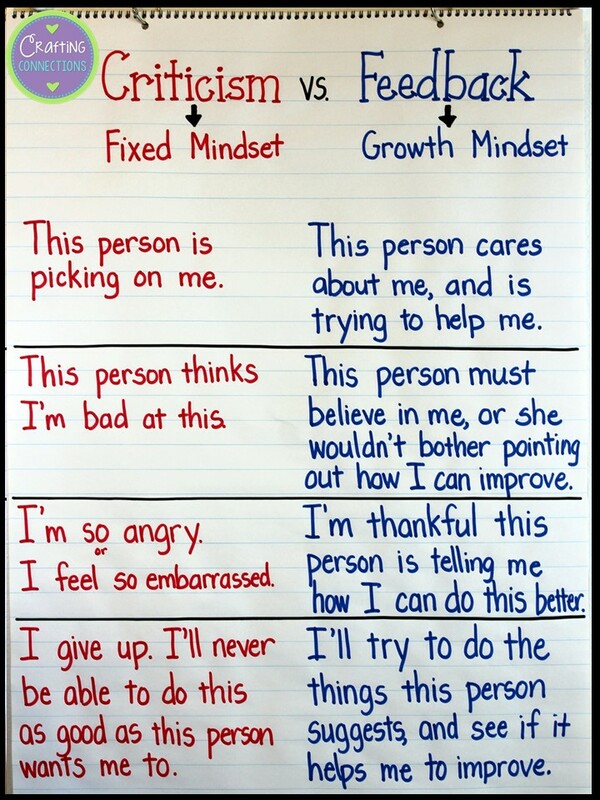 This lesson would work best after students have a basic understanding of the difference between a growth mindset and a fixed mindset. Step 1: Share a real-life personal experience. Friends, let me tell you about my evening yesterday. Technically, it all started yesterday morning. I set my alarm so I would wake up super early, because I wanted to have time to try a new crockpot recipe I had found. I woke up, chopped vegetables, and threw all of the ingredients into the crockpot just like the recipe directed. Then I started the crockpot, and got ready for school. As I was driving to work yesterday morning, I felt sooooo proud of myself! When I got home from school last night, I walked into my house, and it smelled so good! I was thinking about how nice it was to have dinner already made, and how I was going to do this more often. Unfortunately, though, my good vibes were crushed an hour later, when the rest of my family tried my meal. First, Brooke announced that it was too spicy. Then, Kayla stated that she wished she had some rice to eat with it. Then, Troy said it was good, but the chicken was a little overdone, and he asked if I knew how to operate the crockpot's timer so that it could start cooking later. Let me tell you... I felt some anger and resentment bubble up inside of me when I heard everyone's comments! Here I had gotten up early while everyone else was still sleeping to make this dinner. Rather than acting appreciative, though, everyone in my family was complaining!! I was about to tell my family that I didn't appreciate their criticism, when it hit me. Their remarks weren't necessarily critical. They were actually just giving me feedback... their ideas for what would make this meal even better if I decided to make it again. There was no need for me to feel angry and offended. Step 2: Ask student volunteers to share a similar experience. Ask: Has anything similar ever happened to you? Have you ever worked hard on something, only to have another person tell you that it could actually be done better? It usually doesn't take much prompting to convince students to share their own experiences of receiving criticism. However, if they need a few prompts, ask students to think about comments made by parents, teachers, coaches, older siblings, etc. Step 3: Define criticism and feedback. 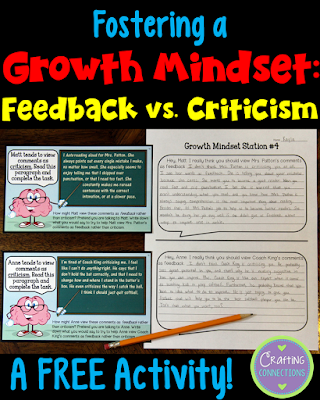 Write criticism and feedback on the board, and tell students that one word is closely associated with fixed mindset beliefs, and the other is more closely associated with growth mindset beliefs. After having students predict the associations, take time to discuss how the words are similar and different. Criticism and feedback are similar in that both involve one person stating their opinion or response about another person's work. The main difference between the two words, however, is closely related to how the receiving person chooses to interpret the statements. People who choose to view the remarks as criticism will get defensive, and will likely start thinking fixed mindset thoughts like "This is too hard" or "I want to give up". On the other hand, people who view the remarks as feedback will start thinking growth mindset thoughts like "This person is trying to help me" or "That's a really good point! I'm going to try that!". Step 4: Empower your students. Discuss the many pros of viewing remarks as feedback, and the cons of viewing remarks as criticism. I tell my students that they will be responding to other people's opinions about their work throughout their lives, and if they can learn NOW how to view these comments as feedback as opposed to criticism, it will truly help them lead happier lives. I love anchor charts, and I believe this is a perfect opportunity to make an anchor chart like the one below with your students. You and your students may choose different ways to phrase the statements, but this one gives you a general idea. Up to this point in the lesson, there has been a lot of discussion, and now I'm ready to give students an opportunity to work with the concept on their own. I display two scenario cards for students (using the document camera), and distribute the response sheets. Students read one of the scenarios, and then write what they would tell their classmate to help him or her view the comments as feedback instead of criticism. If they finish and still have time, they can complete the other scenario in the same way. Click HERE to download this free activity! Step 5: Revisit the topic throughout the year. At the end of this lesson, I tell my students that if they find themselves in a situation where they have to choose whether to view others' remarks as feedback and criticism, I would love to hear about how they handled the situation. In addition, bring it up during your own classroom lessons. 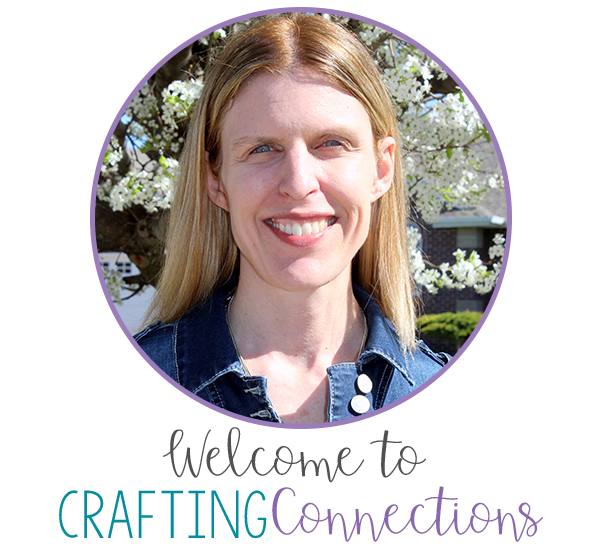 For example, before beginning writing conferences, you might say, "I'm going to be conferencing with students today on their personal narrative rough drafts. I am hopeful that you will all choose to view my comments as helpful FEEDBACK, and not negative criticism." 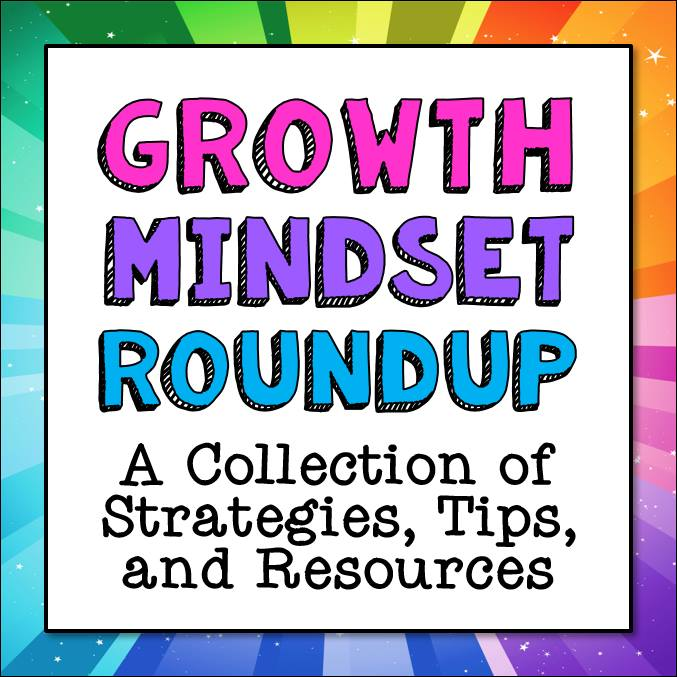 If you're looking for ready-to-go resources that will help you teach your students about effective growth mindset methods, I invite you to check out my Growth Mindset PowerPoint! 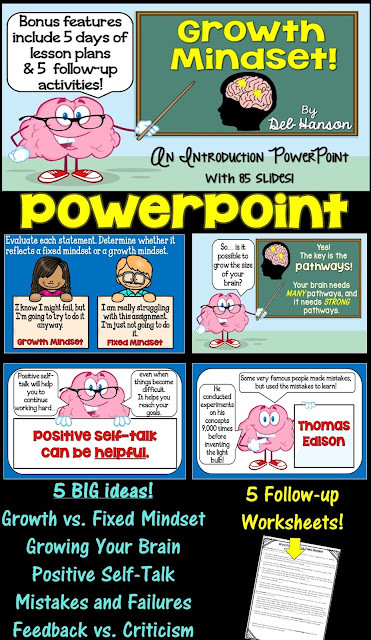 It includes five worksheets plus directions on how to split the PowerPoint into a 5-day unit. Looking for more Growth Mindset tips? 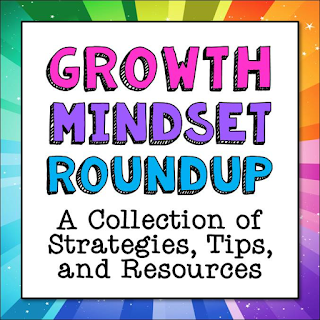 I have teamed with several 2nd-6th grade bloggers to create this Growth Mindset Roundup of ideas. Hop around to the different blogs and check out the great tips!